Dweezil Zappa, son of the legendary composer/guitarist Frank Zappa, will be bringing his own brand of rock music compositions and “arrangements of complex nature”, to the Warfield this June, as he and some of his father’s greatest sidemen, saxophonist Napoleon Murphy Brock and drummer Terry Bozzio, re-create the “ironic sense of humor in both music and personality” the Zappa name has become known for. “Zappa Plays Zappa”, will feature the music of his father, as well as the music of Dweezil Zappa’s newest CD, aptly titled “Automatic”. It’s his first release under his own name in nearly a decade and marks a return to his roots as a guitarist. It’s also the first predominately instrumental guitar album of his career. Operating under the musical credo “anything at anytime for any reason at all” gave Dweezil the freedom to explore new territory. The album features thick layers of multi-tracked guitar textures, all perfectly executed and combined with wild rhythms and intriguing improvisations, adding nicely to the Zappa Family legacy which has provided alternative entertainment for those who have embraced it for over thirty years. 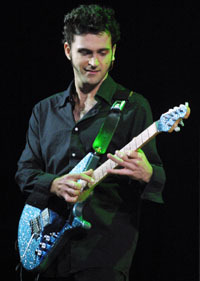 At 31 years of age, Dweezil has found himself involved with a plethora of wide ranging projects throughout his career. It has sometimes been difficult even for Dweezil to define what he really does. Besides being regarded as a world class guitarist, he has hosted various television shows (including MTV and Happy Hour with his brother Ahmet). He has acted in film (The Running Man, Pretty in Pink, Jack Frost), television (Normal Life with his sister Moon, The Chris Isaak Show, Mad TV) and done voice-over work for the animated series Duckman (role of “Ajax”). He has been a frequent guest on television shows such as Politically Incorrect and Late Night with Conan O’Brien. He was nominated for a Grammy for his work with Herbie Hancock on the surf-classic “Wipe Out” for the Back of the Beach soundtrack. He has since worked on other soundtracks, having recently recorded a hard-rocking version of the Britney Spear’s classic “Baby, Hit Me One More Time”. He has composed television themes for The Ben Stiller Show and Roseanne, and has scored episodes of Pee-Wee’s Playhouse, performed as a session guitarist, and has recently been collaborating with partner Lisa Loeb as a songwriter and co-producer on her upcoming release. One more thing Dweezil found time to do on “Automatic” was his own engineering. “It was fun for me to do. I’ve spent a couple of years noodling around with recording equipment, and felt I could get the sounds I was hearing in my head on tape for this project”. Although Dweezil spent most of the time working on his own on the album, he was not completely alone. He was joined by several talented musicians, including one of his father’s greatest drummers, Marin’s Terry Bozzio, and bassist Scott Thunes. Dweezil says “the idea for the record started with ‘The Grinch’.” His guitar rendition of the Dr. Seuss classic features his brother Ahmet performing the lead vocal in all of its baritone splendor. “When I finished that song I thought, hmm… I should probably make a collection of songs to go around this and release it around Christmas. So I did. Prior to that, I had lost interest in releasing any of my music. I was disappointed by the lack of interesting musicianship in most popular music, so I just stopped playing. Some close friends encouraged me to reverse my decision and now I’m happy to be playing again. I was really disenchanted with the industry at large and in fact, I still am. I just see so much bad behavior and posturing being rewarded out there. ‘Mediocrity is King and creativity is a liability’. But that’s just the way it is, regardless of what I think about the industry. I’ve learned that I shouldn’t let it deter me from making the music that I would like to hear. There has to be a few other disenchanted guitar music fans out there, and this record is for them”. The recent release of some of Frank Zappa’s final recordings of his arrangements of his childhood idol, avant garde composer Edgar Varese, and Dweezil’s “Automatic”, should give Zappa fans something to cheer for. His legacy as one of the greatest guitarist and composers of our age, most certainly lives on through the efforts of his wife Gail, (who battled to obtain the tapes of the Varese recordings), and his sons Dweezil and Ahmet. After over 30 years, we’re still “Just Hungry Freaks Daddy”, for the music of Zappa.